Gail M. (Barter) Hodgdon, 65, of Boothbay, passed away on Saturday, June 10, 2017 in the Mid-Coast Hospital in Brunswick surrounded by her family. She was the loving wife of Neil K. Hodgdon with whom she shared forty-eight years of marriage. She was born on July 1, 1951 and was the daughter of the late Grover and Nancy (Little) Barter. 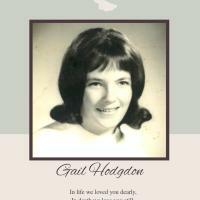 Gail was a graduate of Boothbay Region High School. She worked as a housekeeper at Captain Fish’s Motel and Marina for over twenty years. In addition to her husband, she was the loving mother of Stacey Mclellan and Kristin Hodgdon; five grandchildren, Gage and Jordan Wahlstrom, Nicholas Hodgdon, Breannah Allison Morris and Bayleigh Spring Morris; four great-grandchildren, Jaelynn Roze and Skylar Jade Wahlstrom, Brantley Christopher Sproul and Elliot Neil Beaulieu; one brother, Grover Barter and one sister, Kathy Barter. She was also predeceased by her brother, James Barter.